Mark's Tickets is the best place to find tickets for New England Patriots fans. Just check this page for any new events or schedule updates throughout the year. We sell tickets to every New England Patriots game around the world. We know how passionate New England Patriots fans can be about football, so we make sure to have hundreds of tickets for every game available right up until it starts. For those looking for cheap New England Patriots tickets, we offer tickets starting at very low prices (many times below face value). 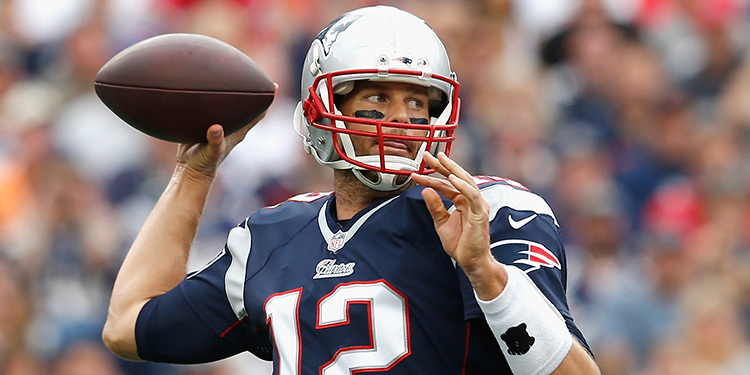 We offer tickets in most sections of every venue that you can see New England Patriots. Simply choose the city or venue that you are interested in below, and you will be able to see all of the available seats. Do not forget that Marks Tickets also specializes in sold out New England Patriots tickets. No longer will sold out shows prevent you from seeing New England Patriots. The New England Patriots are a professional football team that plays in the NFL. The Patriots play their home games at Gillette Stadium in Foxborough, Massachusetts. With 16 games per year, and 8 being home games, The New England Patriots are a professional football team based in the Greater Boston area, playing their home games in the town of Foxborough, Massachusetts at Gillette Stadium. The team is part of the East Division of the American Football Conference (AFC) in the National Football League (NFL). The team changed its name from the original Boston Patriots after relocating to Foxborough in 1971, although Foxborough is a suburb of Boston, 22 miles (35 km) away. Since the arrival of current head coach Bill Belichick in 2000, the Patriots became one of the most successful teams in NFL history. They are third in appearances in a Super Bowl with seven (the Pittsburgh Steelers and Dallas Cowboys each have 8), and have the most appearances in the last 25 years. They have won all but two AFC East titles since 2001, and have not had a losing season since 2000. Before Belichick arrived, the Patriots had only notched consecutive playoff appearances twice in their history. Between 2001–2010, the Patriots set a record for most wins in a decade (121, different from conventionally bounded decades, 2000–2009, 1990–1999, etc. ; this record references any ten-year stretch; 2nd is the 1984–1993 San Francisco 49ers, with 120 wins); they broke their own record in 2011 (2002-2011 - 123 wins), and again in 2012 (2003-2012 - 126 wins - nearly 13 regular season wins per season). Between 2001 and 2005, the Patriots became the second team in NFL history (after the Dallas Cowboys) to win three Super Bowls in four years (Super Bowl XXXVI, XXXVIII, and XXXIX), and the eighth (and most recent) to win consecutive Super Bowls. The Patriots, however, were defeated by the New York Giants in Super Bowl XLII, after winning the first 18 games of their 2007 season. They were defeated again by the Giants in Super Bowl XLVI. During Belichick's tenure with the team along with quarterback Tom Brady, the Patriots have also compiled the longest winning streak consisting of regular season and playoff games in NFL history, a 21-game streak from October 2003 – October 2004. The Patriots contest one of the most bitter rivalries in the NFL, with the New York Jets.